MOSCOW, Russia -- Finally Putin has figured out how to sell his invasion to Obama. Unlike Soviet Russia, Putin's Russia can't count on a reliable leftist base for its propaganda. So it bombards the margins with messages tailored to them. This tactic mainly targets the extremes, the far left and the far right, conspiracy theorists, anarchists, people who are willing to embrace anything that is anti-establishment. That's the basic principle of Russia's RT which fuses tabloid sensibilities with radical politics. The tactic occasionally picks up traitors like Edward Snowden, a Ron Paul supporter who turned into the Aldrich Ames of the 21st century, selling out American secrets to Moscow. Mostly it works on people who aren't paying attention because there are too many contradictory messages. Putin's Russia (unlike America) is a place where you can really be free under a strong regime. It doesn't invade other countries (like America) but when it does, it's only because America backed it into a corner. It's a strong "Christian" country that doesn't oppress Muslims, but strongly fights terrorism, but not in a bad American way that violates civil rights. Anyone who knows what's actually going on in Russia knows all this is up there with the old Soviet propaganda garbage about how Americans were starving while Soviet agriculture was booming. Russia and Ukraine have both struggled to make Americans care about their war. For Russia, it's a more uphill battle. To the margins, it dispatches messages about a neo-conservative globalist international conspiracy that forced it to invade and annex part of another country. This stuff plays well to the Glenn Greenwald-Ron Paul crowd that believes it anyway. Making anyone else believe it is harder. So here comes a new talking point to warm the cockles of the Social Justice Warrior heart. This comes from Mikhail Klikushin, who has been noted for throwing out Russian government talking points before. Unlike his peers, he has a very personal reason to want this happen. Zhan Beleniuk is a typical Ukrainian in every way but his skin color. His father, who he never knew, was from Rwanda. He was a student of the Aviation Institute in the Soviet Ukraine and, being a pilot, was killed in action at the time of war in this African country. Zhan’s Ukrainian mother, Svetlana, raised him alone. Considering the kinds of people the USSR tended to train, we can hazard a guess about poor dear Zhan's father. But finally Putin has brought back that classic staple of Soviet propaganda, "And you are lynching Negroes". "And you are lynching Negroes" goes something like this. The American asks: "How many decades does it take an average Soviet man to earn enough money to buy a Soviet car?" After a thoughtful pause, the Soviet replies: "And you are lynching Negroes!" So now Ukraine is "lynching negroes". There are others in the country whose looks don’t fit the profile of an Aryan Ukrainian, a profile celebrated by Ukrainian nationalists enjoying their moment in a lot of places of power in the country, other much more vulnerable than Zhan, who for different reasons came to Ukraine from Africa and now have to experience racism on the streets almost every day. In the end of July, a number of Ukrainian newspapers broke the story of 23-year-old Asi, a refugee from the African state of Sierra Leone who came to Ukraine just six months ago. The bus driver called police, who upon arrival … hand-cuffed and took away the unfortunate victim of racial abuse who was hysterically screaming in English, facing the hostile crowd of Ukrainian “Europeans” who couldn’t understand her pleas. In Russia though, this kind of thing does not happen because no one is racist in Russia and everyone loves Africans who show up there. Sometimes they love them to death. The men who jumped the Ivory Coast migrant at a crowded Moscow train station last November did not rob him. But they damaged his jaw to the degree that doctors had to install a metal plate to hold it in place. It took Bazie four months to raise the $3,600 to undergo surgery. In the Nov. 2 Section A, an article about hostility against African blacks in Russia said there had been 177 reported acts of violence against blacks in Russia since 2010, according to the SOVA Center for Information and Analysis. There were actually 177 reported violent acts against blacks since 2008, SOVA officials say, six of which ended in death. His story is not uncommon, Russian civil and human rights leaders say. African migrants face widespread hostility and racism that usually go unpunished. This sort of thing happened a lot back in the Soviet days when the regime was importing African Communists to train as terrorists at their universities on a regular basis. It shouldn't be surprising because, contrary to liberal dogma, 90 percent of the world is racist. And I'm being generous here. 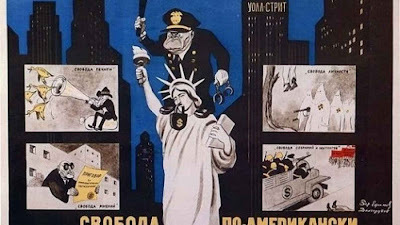 Russia and Ukraine are just as racist and Russian propagandists really need to stop moving old Soviet propaganda here. There's a reason, "And you are lynching Negroes" became a cliche, a sign of how bankrupt and dishonest Soviet propagandists were. The only people who believe this garbage also believe everything Max Blumenthal and Glenn Greenwald say.